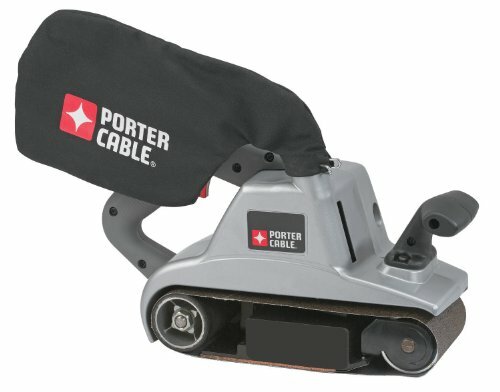 The Porter-Cable 362V belt sander is a beast of a machine. Because of its large 4” surface area and high-capacity, this sander is suggested for use only by professional woodworkers and contractors who need the extra bump in power. The robust 12 AMP engine makes light work of even the most time-consuming projects. This amount of power justifies the size of the machine. It would not be ideal to use the Porter-Cable 362V for smaller projects. This sander is quite bulky though, and therefore sometimes precision spots may need to be polished up using a smaller sanding tool after a run of the Porter-Cable 362V. Despite its size and high-capacity, the ergonomic design makes this sander safe to use and simple to handle. Though mostly used by professional contractors, the Porter-Cable 362V can be safely handled even by a beginning woodworker. The design also features a mostly metal frame. This feature means long-term usage is an option without compromising the integrity of the systems. Disassembling the system can sometimes be a hassle, but the process is made safe by using plastic instead of metal in key places. But, with the Porter-Cable 362V you won't often have to worry about disassembling the components to perform maintenance. The Porter-Cable 362V has preventative design that routes dust away from the internal systems of the machinery. Speaking of dust, the collection bag comes with a full on 360 degree swiveling function. This feature makes fumbling with an inconveniently placed bag a thing of the past. If you find yourself working a larger job, the Porter-Cable 362V also comes with the option of connecting an external port or shop vacuum. This heavyweight contender of a belt sander has many perks, but also some downsides. Large Projects – With adjustable belt speeds ranging from 1,000 to 1,500 sfpm, the Porter-Cable 362V works great for working on larger projects like boats, walls/ceilings, flooring, and similar surfaces. Belt Accessibility – The belt can be quickly switched out when you need to make a change in grit. Through the same mechanism, it can also easily be seen while the Porter-Cable 362V is still fully assembled. This feature assures that users can quickly find damage to the sanding belt immediately and swap it. Safety – The design of the Porter-Cable 362V also uses flat edges to safely contain the belt and lower the risk of catching foreign objects, like hands or clothing, in the sanding belt. Weight – The Porter-Cable 362V comes in at a whopping 12 lbs. Usability – Because of its large size and heavy-duty designation, the Porter-Cable 362V fails to perform acceptably for light resurfacing or finishing jobs. Though this is to be expected and is easily compensated for by its high functionality when it comes to working with the roughest of surfaces. Overall, this heavy-duty belt sander performs well above the average on rougher surfaces. It is easy to handle and definitely fulfills the needs of even the busiest contractors. Though it is almost entirely limited to bulkier projects, the Porter-Cable 362V is definitely a worthwhile purchase for you average or professional woodworker.